A long time ago in another galaxy, the enigmatic Zeledonia coronata was believed to be a thrush. 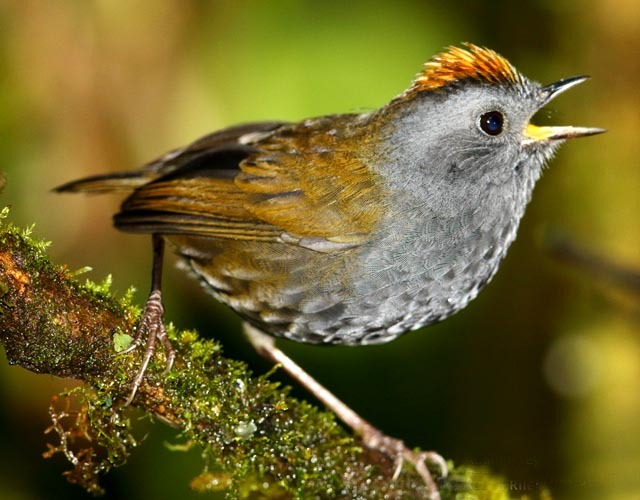 Austin (1961) wrote: "Oddest of the new World thrushes is the tiny Wrenthrush (Zeledonia), a shy resident of the high mountain forests above 5,000 feet in Costa Rica and western Panama. It creeps and hops around, wren fashion, on the forest floor. The Wrenthrush is unique among thrushes in having its 10th primary so greatly shortened that some students put the bird in a family by itself. Its voice is reported as a clear, musical whistle repeated 6 or 8 times at equal intervals." This wonderful photo of Wrenthrush in song (left) is by Adam Riley. Austin (1961) continued: "In its short tail and short, rounded wings it seems most closely related to the shortwings (Bracypteryx), a small group of six Asiatic thrushes.... The shortwings are also wrenlike birds of forest thickets at high altitudes, but unlike the Wrenthrush, the shortwing sexes differ in color." When Harrison (1979) published his review of the bird families of the world, Zeledonia was still among the thrushes, but it was noted that: "The Wrenthrush has often been placed in a distinct family, because of its syndactyl feet (in which two toes are joined for part of their length) and other peculiarities." But Wetmore et al. (1984) moved it to the New World Warblers [Parulidae], citing electrophoric and skeletal studies that suggested it was an aberrant parulid, probably most closely related to Basileuterus warblers. They also suggested its English name become Zeledonia. Lovette & Bermingham (2002) conducted a molecular study of the genera assigned to the New World Warblers [Parulidae] and found six that did not appear to share the same common ancestor. These included Zeledonia and a number of Caribbean genera, include the Cuban warbler genera Teretristris (see below). Barker et al. (2012) used both nuclear and mtDNA to construct a phylogeny of New World nine-primaried passerines. They found that Zeledonia and Teretristris had become evolutionarily distinct about 12 million years ago, and might be each other's closest relative. There was some evidence that Yellow-breasted Chat Icteria virens might also be related, but other evidence pointed against that. In the "big picture" it looked like Wrenthrush and Cuban warblers fell somewhere between Parulidae and Icteridae. From these data, Barker et al. (2013) proposed that Wrenthrush be assigned to its own family [Zeledoniidae] and that the two Cuban warblers be assigned to their own family [Teretristidae]. These would create about the youngest bird families on planet Earth. I've dithered about what to do with all this information. Initially I followed the Howard & Moore checklist, 4th ed. [Dickinson & Christidis. 2014] and its compromise position. They placed both Zeledonia and Teretristris in the same new Zeledoniidae family. However, I now follow Winkler et al. (2015) who elevated both clades to full Family status. Photos: Adam Riley photographed the singing Wrenthrush Zeledonia coronata at Savegre, Costa Rica, in 2015. Credited photos © Adam Riley, and used with permission; all rights reserved. Bibliographic note: There is no "family book" per se, but an introduction to the birds in this tentative family is in Curson (2010). Austin, O.L. 1961. Birds of the World: a Survey of the Twenty-seven Orders and One Hundred and Fifty-five Families. Golden Press, New York. Barker, F.K., K.J. Burns, J. Klicka, S.M. Lanyon, and I.J. Lovette. 2013. Going to extremes: contrasting rates of diversification in a recent radiation of New World passerine birds. Syst. Biol. 62: 298–320. Curson, J.M. 2010. Family Parulidae (New World Warblers), pp. 666 –800 in Handbook of the Birds of the World (del Hoyo, J., A. Elliott & D.A. Christie, eds). Vol. 15. Lynx Edicions, Barcelona, Spain. Dickinson, E.C., and L. Christidis. 2014. The Howard and Moore Complete Checklist of the Birds of the World: Passerines Vol. 2. Aves Press, Eastbourne, U.K.
Harrison, C.J.O. 1979. Bird Families of the World in Birds: Their Life, Their Ways, Their World (C. Perrins, ed.). Reader's Digest Association, Inc., New York. Lovette, I.J., and E. Bermingham. 2002. What is a wood-warbler? Molecular characterization of a monophyletic Parulidae. Auk 118: 695–714. Wetmore, A., R.F. Pasquier, and S.L. Olson. 1984. The Birds of the Republic of Panama. Part 4. Smithsonian Instit. Press, Washington, D.C.